Gallileo, Copernicus, Newton, Niels Bohr, Einstein. Their insights shook our perception of who we are and where we stand in the world and in their wake have left an uneasy co-existence: science vs. religion, faith vs. empirical enquiry. Which is the keeper of truth? Which is the true path to understanding reality? 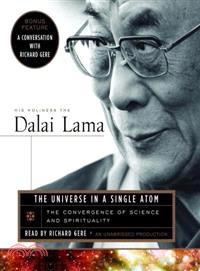 After forty years of study with some of the greatest scientific minds as well as a lifetime of meditative, spiritual and philosophical study, the Dalai Lama presents a brilliant analysis of why both disciplines must be pursued in order to arrive at a complete picture of the truth. Science shows us ways of interpreting the physical world, while spirituality helps us cope with reality. But the extreme of either is impoverishing. The belief that all is reducible to matter and energy leaves out a huge range of human experience: emotions, yearnings, compassion, culture. At the same time, holding unexamined spiritual beliefs–beliefs that are contradicted by evidence, logic, and experience–can lock us into fundamentalist cages. This breathtakingly personal examination is a tribute to the Dalai Lama’s teachers–both of science and spirituality. The legacy of this book is a vision of the world in which our different approaches to understanding ourselves, our universe and one another can be brought together in the service of humanity. Tenzin Gyatso, His Holiness the Fourteenth Dalai Lama, is the recipient of the Nobel Peace Prize and is both the temporal and spiritual leader of the Tibetan people. The Dalai Lama travels the world speaking on peace and interreligious understand, giving Buddhist teachings, and meeting with political leaders as he works tirelessly on behalf of the Tibetan people. He resides in Dharamsala, India, and is the head of the Tibetan government-in-exile.